Hormone production and release are primarily controlled by negative feedback. In negative feedback systems, a stimulus elicits the release of a substance; once the substance reaches a certain level, it sends a signal that stops further release of the substance. In this way, the concentration of hormones in blood is maintained within a narrow range. For example, the anterior pituitary signals the thyroid to release thyroid hormones. 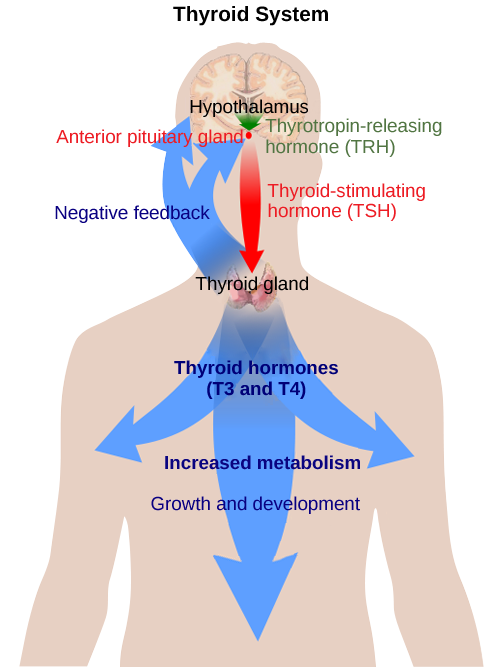 Increasing levels of these hormones in the blood then give feedback to the hypothalamus and anterior pituitary to inhibit further signaling to the thyroid gland, as illustrated in Figure 1. There are three mechanisms by which endocrine glands are stimulated to synthesize and release hormones: humoral stimuli, hormonal stimuli, and neural stimuli. Hyperthyroidism is a condition in which the thyroid gland is overactive. Hypothyroidism is a condition in which the thyroid gland is underactive. Which of the conditions are the following two patients most likely to have? Patient A has symptoms including weight gain, cold sensitivity, low heart rate and fatigue. Patient B has symptoms including weight loss, profuse sweating, increased heart rate and difficulty sleeping. Patient A has symptoms associated with decreased metabolism, and may be suffering from hypothyroidism. Patient B has symptoms associated with increased metabolism, and may be suffering from hyperthyroidism. The term “humoral” is derived from the term “humor,” which refers to bodily fluids such as blood. A humoral stimulus refers to the control of hormone release in response to changes in extracellular fluids such as blood or the ion concentration in the blood. For example, a rise in blood glucose levels triggers the pancreatic release of insulin. Insulin causes blood glucose levels to drop, which signals the pancreas to stop producing insulin in a negative feedback loop. Hormonal stimuli refers to the release of a hormone in response to another hormone. A number of endocrine glands release hormones when stimulated by hormones released by other endocrine glands. For example, the hypothalamus produces hormones that stimulate the anterior portion of the pituitary gland. The anterior pituitary in turn releases hormones that regulate hormone production by other endocrine glands. The anterior pituitary releases the thyroid-stimulating hormone, which then stimulates the thyroid gland to produce the hormones T3 and T4. As blood concentrations of T3 and T4 rise, they inhibit both the pituitary and the hypothalamus in a negative feedback loop. In some cases, the nervous system directly stimulates endocrine glands to release hormones, which is referred to as neural stimuli. Recall that in a short-term stress response, the hormones epinephrine and norepinephrine are important for providing the bursts of energy required for the body to respond. Here, neuronal signaling from the sympathetic nervous system directly stimulates the adrenal medulla to release the hormones epinephrine and norepinephrine in response to stress. Hormone levels are primarily controlled through negative feedback, in which rising levels of a hormone inhibit its further release. The three mechanisms of hormonal release are humoral stimuli, hormonal stimuli, and neural stimuli. Humoral stimuli refers to the control of hormonal release in response to changes in extracellular fluid levels or ion levels. Hormonal stimuli refers to the release of hormones in response to hormones released by other endocrine glands. Neural stimuli refers to the release of hormones in response to neural stimulation.